Taaleem Award – Emirates Airline Festival of Literature. 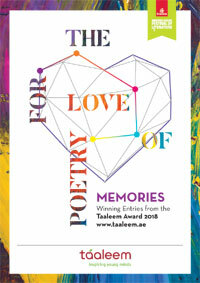 The Taaleem Award is a poetry-writing competition for school and university students, held annually by the Emirates Airline Festival of Literature. The inspiration for 2019 is Other Worlds . Congratulations to the winner of the 2019 Taaleem Award! Write your poem – use your imagination and creativity to the full, but do remember that your inspiration is Other Worlds. You may choose your own title in keeping with Other Worlds. Entries can be in Arabic or in English. The poem should not exceed 32 lines. Complete all sections of the online entry, attaching your poem. You can find some tips on writing a good poem here. Entrants must be in full-time education and resident in the UAE. Copyright of material submitted remains with Emirates Airline Festival of Literature. Do not submit work as your own when part of or all of it has been done by someone else; this includes material found online. It must be entirely your own work, and any poems found to contain non-original content will be excluded. The winning entrants agree to the Emirates Literature Foundation’s, Emirates Airline Festival of Literature’s and Taaleem’s use of their name and photograph in relation to related publicity material and activities. Schools and students should be aware that they might need to obtain parental consent for this. Poems should be submitted in Times New Roman font, size 12 point, 1.5 line spacing. Poems should be unpublished and not previously submitted to any competition. Poems should be no longer than the word limit (entries exceeding the word limit are disqualified). Entries must be received on or before the closing date of 7 November 2018 . Judges’ decisions are final and no correspondence will be entered into with regard to these decisions. In accordance with normal conventions for international writing competitions, entries which do not adhere to the said terms and conditions will not be considered. Please check that you have followed all the conditions before submitting your poem. Only the winners will be notified in advance by email or telephone, by the middle of January 2019 . All participants will receive a certificate of participation upon submitting their story through the website, and are welcome to join us at the prize-giving ceremony at the Festival. The Award Ceremony will take place during the Festival, on 2 March 2019 .